Newly released patent applications from Microsoft have sparked speculation that it is to unveil a Wii remote rival at the E3 expo in Los Angeles. An application was filed in 2007 for a motion controller, dubbed Magic Wand, that interacts with "a collection of sensors". Microsoft says it will not "comment on speculation" about a possible launch. 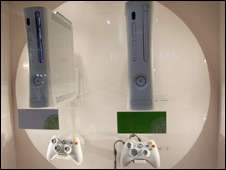 Gavin Ogden, from gaming site c&vg.com, told the BBC that Microsoft needed to "jump on the motion sensor bandwagon". "We thought they were going to show something off at the E3 Expo in 2007 - some sort of waggle stick - but nothing materialised," he said. "I have no doubt they are going to try and do something, although it remains to be seen how they do it." The patent application also describes "biometric sensors" that would examine "fingerprint, hand geometry, hand vein pattern, palm pattern, and grip configuration" along with "facial thermogram, a facial feature, a retinal feature, or an iris feature". "There was talk, a long time ago, about mapping people's faces on to characters," said Mr Ogden. "However, there were concerns that people would stick real faces on it - such as Gordon Brown - and then spend all day shooting them. The world wasn't ready for that." At the beginning of May, Microsoft's boss, Steve Ballmer, gave a speech to the Dallas Regional Chamber and was quoted as saying: "Pay attention to the stuff we're announcing in the next month on Xbox." So the industry will be waiting to see if Microsoft comes up with any surprises at the Los Angeles expo in June.